From left, NEC Jerry Benjamin, JWV Post 256; Original Pancake House co-owner Jonathan Seyoum; Maurice “Maury” Schermann; Betty Bailey; Original Pancake House co-owner Mark Davis Bailey; Mark’s wife, Judy; store general manager Dan Williamson; and store manager Alex Vignan. Maurice “Maury” Schermann, a 95-year old Army Air Corps veteran of World War II and longtime member of Jewish War Veterans Dallas Post 256, was honored in a surprise ceremony at his favorite location of the Original Pancake House restaurant chain on Veteran’s Day weekend. 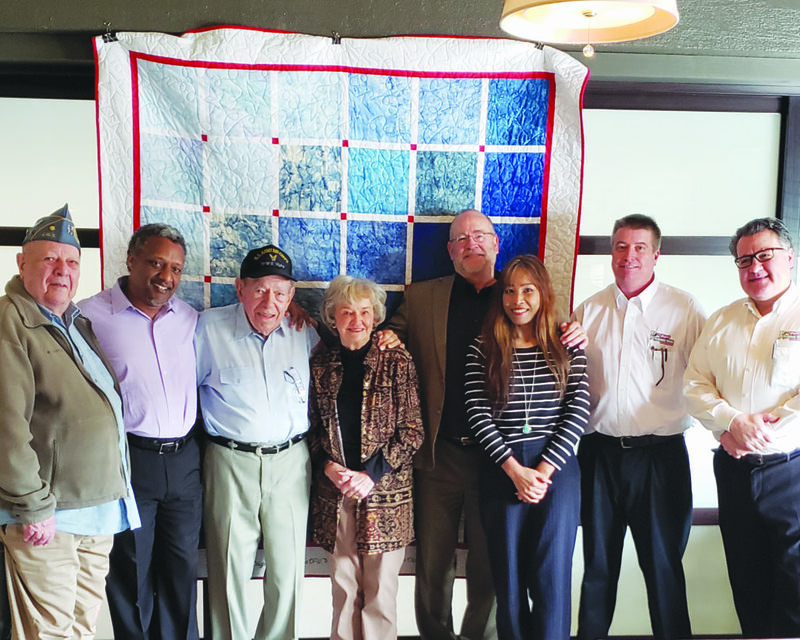 Mark Davis Bailey, co-owner of the eight-location DFW group, presented Schermann with a Stars & Stripes-themed quilt hand-crafted by his mother, Betty. Bailey estimated that over the course of Schermann’s 12-plus years as an Original Pancake House regular, he has raised more than $100,000 through individual efforts and as part of Post 256’s semiannual poppy drives. All funds collected go toward the JWV’s mission, supporting local hospitalized and homeless veterans, including holiday visits and gift bags, special-occasion meal events and “quality of life” upgrades, such as recreation and therapy room equipment, for the Dallas and Bonham, VA, facilities. Schermann’s devotion to all things “veteran,” along with his warm personality, have endeared him to customers and Original Pancake House management. He has become an honorary member of the Bailey family and regular patrons often ask about Schermann if he’s not at his customary table near the entrance, usually holding a JWV collection bucket. 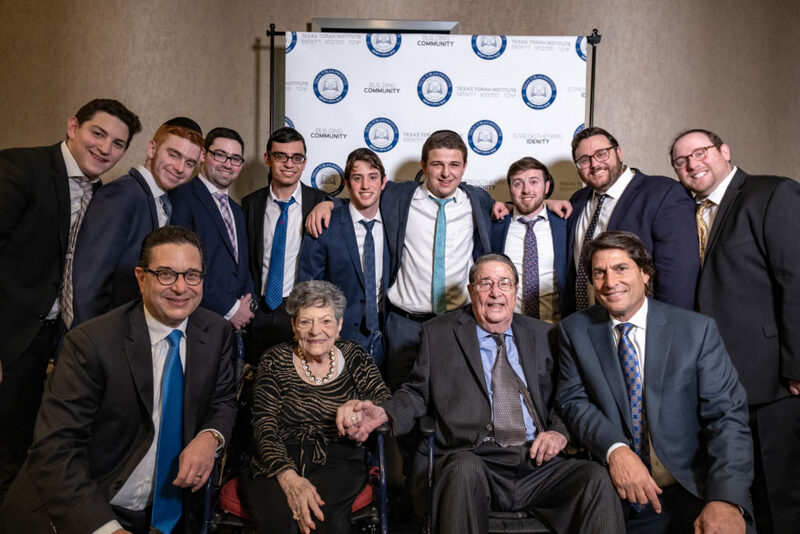 Texas Torah Institute student surround, bottom row from left, Ken Goldberg, Lois Goldberg, Bob Goldberg and Neil Goldberg at the school’s Scholarship Gala. “L’Dor v’Dor: The Eternal Chain” was the theme of Texas Torah Institute’s 15th annual Scholarship Gala Dec. 15 at the Renaissance Dallas Addison Hotel. TTI honored Bob Goldberg with its Lifetime Achievement Award and Shane Stein with its Community Leadership Award. Lt. Col. Allen West was the guest speaker. 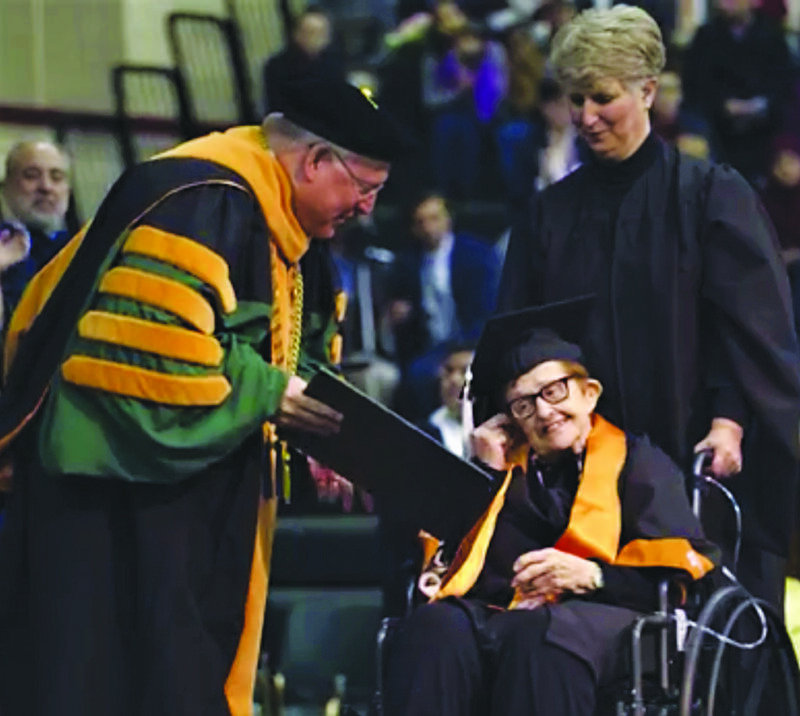 Janet Fein, 84, is among the newest graduates in the Class of 2018, honored with her diploma by UT Dallas President Richard Benson. Janet Fein, 84, graduated from the University of Texas at Dallas on Dec. 19, six years after returning to school, bound and determined to earn her bachelor of arts degree in sociology. One of nearly 2,800 students receiving their diplomas, Fein’s story has traveled the globe, picked up by more than 850 entities since first appearing in a Dec. 6 Texas Jewish Post article. “I can’t even express how overwhelmed I feel and how appreciative I am of everyone’s support and help and concern,” said Fein, who received accolades, calls from near and far, and bouquets of flowers, including one from UTD President Richard Benson. Fein, a New York native who graduated from high school at 16, received her associate’s degree in 1995, then returned to school in 2012 after retiring from her work at Texas Scottish Rite Hospital. Fein completed her last courses online after her health made her wheelchair bound. She had taken a DART bus to UTD, oxygen in tow. Lauded by her children, grandchildren, sister and brother-in-law, friends and co-workers and thousands in the auditorium who broke into cheers and applause, many in a standing ovation, Fein was glowing throughout the ceremony – wheeled up to the stage to collect handshakes, hugs and her diploma. Going out for a celebratory meal at a favorite Chinese restaurant, the owner showed her an article and translated it to English for her. Newspapers, television and radio stations, and more have been calling. A $15,000 grant from the Katherine C. Carmody Charitable Trust will allow the Dallas Jewish Community Foundation and the Southwest Community Foundation to produce a free series that will teach nonprofit organizations how to build a legacy giving program. These programs will seek legacy gifts to be invested so the nonprofits earn income in the future. The importance of legacy giving also will be discussed. The Dallas Jewish Community Foundation and its DBA, the Southwest Community Foundation, have worked to improve the community and the world through the development and stewardship of philanthropic resources of donors and community partners. Consistent with this mission, the Foundation has contributed more than $125 million in charitable distributions in the last decade to support a wide range of philanthropic interests, including education, human services, the arts and faith-based organizations. The legacy giving program’s inaugural session will occur on Feb. 4 and will feature Phil Cubeta, assistant professor of philanthropy at the American College of Financial Services in Bryn Mawr, Pennsylvania. Each session is meant for both volunteers and staff of nonprofit agencies. A kosher lunch will be provided. All nonprofits are welcome to register for this free series of lunch and learns. For information, visit www.djcf.org. 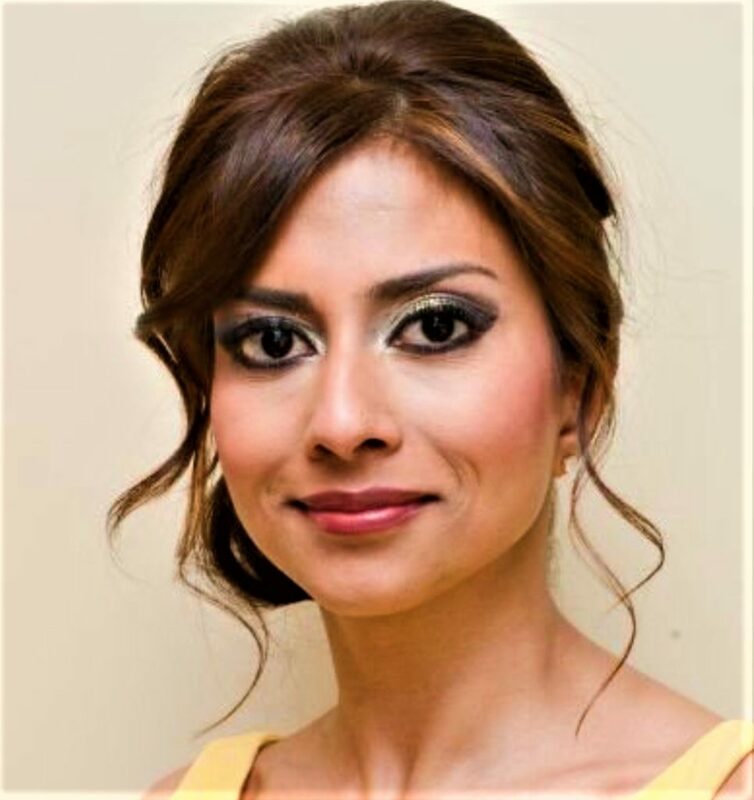 Tania Joya, an activist and former wife of an ISIS leader, will speak about “Escape and Triumph” at the 2019 Intra-Faith Sisterhood Brunch on Jan. 13. Tania Joya, an activist and former wife of an ISIS leader, will be the featured speaker of the 2019 Intra-Faith Sisterhood Brunch, the theme of which is “Escape and Triumph,” at 12:30 p.m. Sunday, Jan. 13, at Temple Shalom. The Temple Shalom Sisterhood is host of the 16th annual brunch, which is open to everyone ages 15 and older. “Tania will speak about her transition from a marriage to a ranking ISIS member, to one countering the forces of violent extremism, and I believe the audience will be fascinated by her,” said Jerri Grunewald, who is co-chairing the event with Beth Lasher. The annual Sisterhood Intra-Faith Luncheon is hosted each year by a different Metroplex-area congregation, bringing together sisterhood members from all branches of Judaism. The hosting chapter creates the program and menu, and coordinates the afternoon. Previous guests have been Holocaust survivors, chefs, artists, experts on environmental issues and the history of Jews in Texas. “Sisterhood is about social justice, about caretaking, about women who are professionals, at-home, who are mothers and those who are not, but it is about leadership and care. The spirit of Tania’s work mirrors a lot of what we are about,” said Grunewald, a former Temple Shalom Sisterhood president, vice president, treasurer and Woman of Valor recipient. Joya, who grew up northwest of London, is a former extremist who now works in deradicalization. Her ex-husband, Plano native John Georgelas, known since conversion to Islam as Yahya al-Bahrumi, was radicalized as a teenager and, to all knowledge, remains active as the highest-ranking American member of ISIS. The couple, who met online at age 19, returned to the United States for a time, then moved to Egypt after the Arab uprising in 2011. Her former husband believed that the surroundings were ripe for his sons to grow themselves to become Jihadists, she said. But even then, Joya had doubts. After the family moved to Syria in 2013, with Joya pregnant with their fourth child, she found the courage to leave, and, with her ex-husband’s help, returned to Plano. Once the family was gone, he became involved with ISIS. She, on the other hand, renounced Islam, remarried and is living a mission of helping others. Joya is now featured in a Clarion Project documentary called “Jihad Generation.” She is a member of Parents For Peace, an alliance of families affected by extremism that focuses on prevention and de-radicalization from extremism. She recently participated in a TEDx interview and is writing a memoir. Joya wants to help rehabilitate extremist radicals, to teach them skills and to give them a sense of community and the opportunity to reintegrate into society and be good citizens. “Jihadists need to be heard because if we don’t know their arguments, and how poor their arguments are, we’re not going to be able to discuss and refute them,” she said. Co-chair Lasher, a former Temple Shalom Sisterhood vice president, said Joya’s story fits well with Sisterhood’s mission. For more information, visit bit.ly/2LnSYma. The brunch costs $20 per person, and registration is required by Jan. 3. To RSVP for more information, contact Toba Reifer at 972-898-4828 or email reifernotary@gmail.com. The secret to long-life is simple, Fort Worth’s Lou Barnett said a few days before his 100th birthday Nov. 22. “Good wine, good cigars and good cognac,” he explained with a twinkle in his eye. Born on Nov. 22, 1918, and raised in Malden, Massachusetts, to Molly and Max Barnett, his parents were first-generation Americans and his father worked as a “warehouse man and shipping clerk,” according to Barnett’s autobiography. The Great Depression hit the family hard, and they struggled. In high school, Lou worked on a government student program for low-income people and made about $12 per week. His mother did piecemeal sewing work from home. When it was time for college, Barnett was offered a half-year semester scholarship to the Massachusetts Institute of Technology. However, because he wasn’t sure how he would pay for future tuition — or food, for that matter — he enrolled at Northeastern University in Boston. He augmented his Northeastern education by taking “as many chemistry courses around Boston as I could.” Ultimately, he graduated from Northeastern with a double degree in engineering and management. Barnett was drafted into the National Guards of Massachusetts in October 1940. His time in the Army was short, as he developed an ulcer and was discharged. He began to contemplate a career in plastics. In the early ’40s, he met the love of his life, Madlyn, of blessed memory. They married on May 5, 1946. Theirs was a love affair that spanned 66 years and was filled with family, fun, hard work and philanthropy. At the time, General Electric was the only plastic company in the Boston area. Initially, he wasn’t able to work in the plastics division because he hadn’t finished his degree yet. He took a job as an expediter for the division that made turbines and other power trains for ships and submarines. Barnett would frequently visit the plastics group in building No. 75, hoping a job would open up. Finally, one did in the engineering group and laboratory. There, he learned how to run machine tools, lathes and milling machines, and also how to run a plastics press and to operate laminators. The Barnetts moved to Fort Worth in 1946 to join Madlyn’s family there. They started their family, first Laurie, then Eliot, followed by Rhoda. By 1952, Barnett’s sister Ruthie and husband Milton Hammil, and brother Stanley and wife Myra also had moved to Fort Worth — as did his parents. Barnett started his business, Loma (for Louis and Madlyn), in 1948 with one rented model of a molding machine. His first order was for plastic fishing lures. In that first year, Loma’s profit was slightly over $1,000, according to Barnett’s autobiography. In 1962, the company was producing 157 plastics articles and using more than 1 million pounds of raw plastics each month. • Plastic roll-top bread box. • Plastic wax paper and paper towel dispenser. • Wastebasket with decorative imprinting embossed on it. • Plastic picnic basket including dinnerware and eating utensils. • The first polyethylene “boat-like” baby bath, followed by a complete line of stylized nursery accessories including the covered diaper pail. • The first plastic outdoor trashcan. Many members of the Fort Worth Jewish community worked at Loma, including the late Irv Levine, Barnett’s childhood friend from Malden, who became Loma president after Loma was sold to Standard Oil of Ohio in 1966. Milton Hamill, who was married to Barnett’s sister Ruthie, moved to Fort Worth and worked for the company. So did Barnett’s father and his brother Stanley. Barnett attributed his success to those friends and family who supported him. Barnett reminisced about some of his favorite memories over the years. He is known for a number of unique hobbies, and he talked about a few of them. Barnett explained how he became a gourmet cook and author of two cookbooks. It started out of necessity. He has several favorite recipes, among them his sought-after salami. His great-granddaughter, Mia, started eating them at age 2. As a New Englander, fish also was a mainstay. “I also made a poached salmon and cucumber. To make good fish, leave it alone. Good fish in itself is excellent,” he advises. There have been cooking mishaps from time to time. For one party, Barnett served peanut soup. He and Madlyn loved to entertain their family and friends. It’s no secret that Barnett has always enjoyed wine and cognac. He partially attributes reaching 100 to the pair. He is a member of the distinguished Confrérie des Chevaliers du Tastevin, the order that has 12,000 Chevaliers worldwide. He explained that he learned about wine while traveling to France on Loma business. Barnett keeps a wine cellar in his home office. He likes to drink Pinot Noir. “It’s a good wine and goes with everything,” he said. With his constant companion, yellow lab Casey, 10, at his side, Barnett explained he was always a dog lover, He developed a passion for raising, showing and judging them. He also raised dogs both as pets and for show. “I’ve had some great ones,” he said. His German Shorthaired Pointer Columbia Rivers Jeep was a six-time Best in Show champion. The family’s first pet was a German Shepherd named Prince Rex King. “We went to Leon [Madlyn’s brother] and Faye’s, and my daughter Laurie was afraid of dogs. I said, ‘Oh my God, I’m not going to have a kid who’s afraid of dogs.’ Madlyn was not too keen on dogs. Our next-door neighbor had German Shepherds. He got me a German Shepherd pup. I take the pup and ring the doorbell of my house, and Madlyn comes to the door, and I shoved it into her arms and said, ‘How can you be afraid of a little piece of fur like this?’ Laurie named the dog Prince Rex King, who grew into the biggest Shepherd the Barnetts ever had. The Barnetts loved to travel, and Lou traveled the world both for business and pleasure. Among his favorite places to travel were Italy, Acapulco and Israel. “I love Italy. Spent a lot of time there. Acapulco. Spent a lot of time down there. That was our escape. Acapulco was wonderful in those days.” The Barnetts took active vacations. Everyone got into the fishing act, especially son Eliot and Madlyn, who caught a huge sail fish in Acapulco. Often, the Barnetts visited synagogues when they traveled. Perhaps the place has loved the most is Israel, where he and Madlyn first visited in 1961. Madlyn, like her mother, Ella Brachman, before her, and her children after her, had a passion for Hadassah. “I’ve been in Israel maybe 50 times. I had a love affair with the country and the people. I set up many clients. Some are still going. There was a Formica-type plant in Israel that I helped start.” Barnett became involved in Israel’s plastics industry, consulting, educating and advising. During his travels to Israel, Barnett met some of the country’s early leaders. “Hell, I knew them all. From Golda Meir. She loved to smoke cigarettes. Chain smoked. Others he met and spent time with were David Ben Gurion, Yitzhak Rabin, Levi Eshkol and Jerusalem Mayor Teddy Kollek. 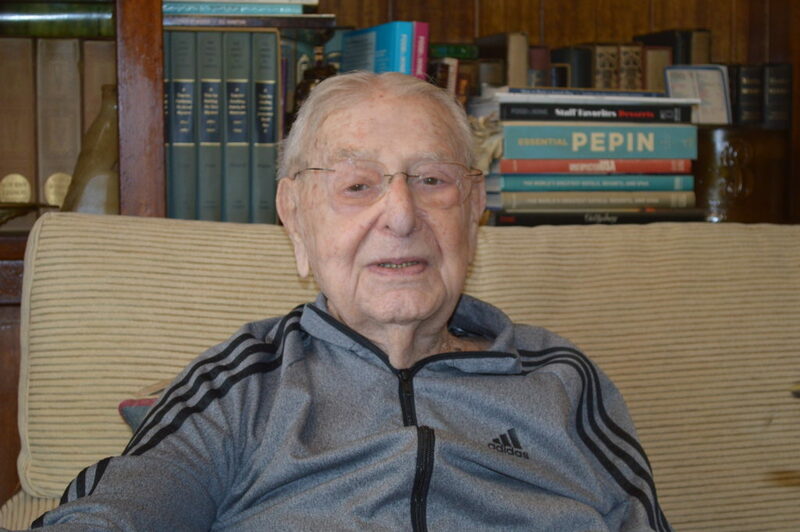 “Teddy Kollek used to come up to my suite and take a nap. Teddy was a real force,” Barnett said. In his memoir, Barnett said he probably has spent more than two years of his life in Israel. He loved to walk Jerusalem and was known for walking around the pool of the King David Hotel every morning while he read the Jerusalem Post. One of his favorite hangouts was a restaurant and bar called Finks. “They made goulash. 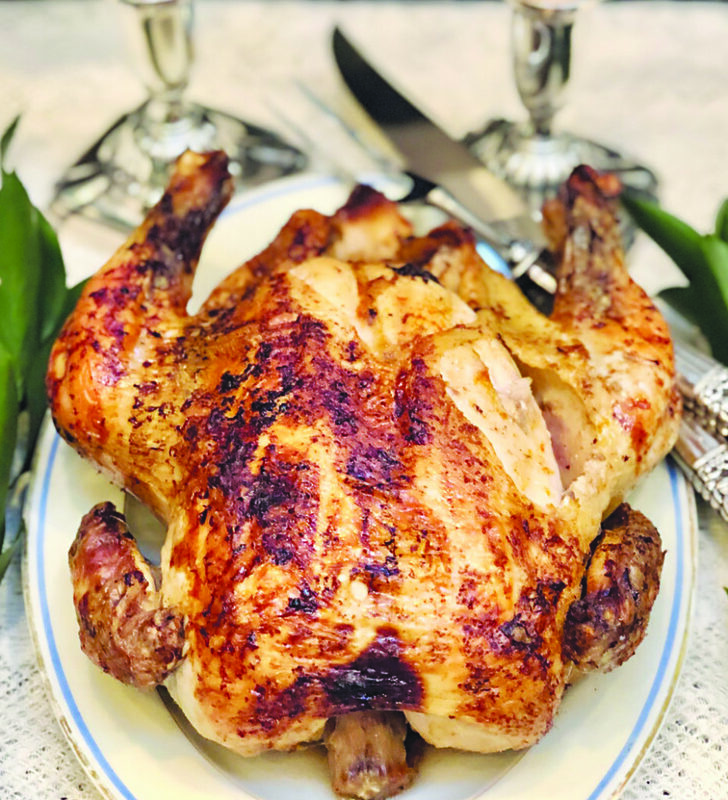 It wasn’t too kosher, but it was delicious,” he said. Barnett said he was proud to have been able to support Madlyn and now his daughters, Laurie and Rhoda, in their passion of Hadassah. The family not only volunteers their time for the organization, but also supports the hospital financially. Barnett has been extremely philanthropic, especially to Hadassah and Northeastern University. His philanthropy seems to always be innovative and have far-reaching effects. He and Madlyn supported Hadassah in many ways, most recently through the Madlyn Barnett Healing Garden in the Sarah Wetsman Davidson Tower at Ein Kerem in Jerusalem. One of the first many years ago was the Ella Brachman Rehabilitation Garden at Mount Scopus campus, also in Jerusalem. Barnett’s greatest joys are his children, Laurie and Lon Werner, Sheryl and Eliot Barnett, and Rhoda and Howard Bernstein. “It’s been a wild ride,” he says. The family has Shabbat dinner most Friday nights with his children, their spouses and niece Debby Rice. It’s dinner and “Wheel of Fortune,” followed by a cigar (preferably an Hoyo de Monterrey) for Barnett. For Downtown, he would pick up the grandchildren. Today, his family has grown further and his heart has grown fuller. Grandson Matthew Bernstein married Natalie, and they have a daughter, Maddison. Grandson Jason Werner is married to Jessica, and they have two children, Mia and Blake. Barnett has been feted numerous times. With his wife, he received the Prime Minister’s Medallion for dedicated effort on Israel’s behalf, and the B’nai B’rith Gold Medallion for Humanitarianism. He was named Jewish Man of the Year by the Isadore Garsek Lodge of B’nai B’rith. Texas Christian University has awarded him an honorary doctor of science, and Northeastern awarded him an honorary doctor of engineering. He is a past president of the Jewish Federation of Fort Worth and Congregation Ahavath Sholom, where he celebrated his second bar mitzvah at age 83. He has served on numerous boards within the Jewish community and the community at-large on local, national and international levels. What’s the Secret to a Great Life? I cannot help but smile when I see people taking “selfies” with their phones. I guess that I am somewhat old-fashioned, but I associate “photography” with cameras and not with cell phones. If you want to think of your cellphone as a camera, be my guest. Who am I to argue? Obviously, we have come a long way in the history of photography. My belief is that most people do not know that Jews have been a significant force in the field of photography. One of the earliest Jewish contributors was Levi ben Gershom, who, in the early 1300s, used a camera-like box to temporarily capture and observe images and eclipses of the sun. It wasn’t an actual camera, but you have to start somewhere. Two years after the Daguerreotype was first developed in 1839, Herman Biouw, a Jewish artist, became famous for portraits of royalty as well as the earliest news photographs, of the Great Fire of Hamburg. Other of Biouw’s historic photos were the first Jewish family portrait (the Hahn family of Berlin) and the first portrait taken of a rabbi, Rabbi Samuel Hirsh of Hamburg. Biouw’s achievement’s included making prints from copper plates, gold-toning and hand-coloring of prints. Tragically, he died as a result of inhaling the fumes of the processing chemicals. Around the same time period in Melbourne, 1842, George Goodman pioneered photography in Australia, opening that nation’s first portrait studio. As interest in photography grew in Australia, Jabez Small opened studios in Melbourne and Sidney and, eventually, a chain of camera shops that his son extended to every major city in the country. In the 1840s, father and son David and Solomon Nunes Carvalho brought studio photography to Charleston, South Carolina. They eventually founded a photographic shop in Los Angeles as well as the city’s first Hebrew School. Other Jewish photographic pioneers included Friedrich Lessman, Mendel Diness (first Jewish photographer in Jerusalem) and Michael Greim (1860). In addition to portraiture, Jewish photographers documented life around them. They were sensitive to the issues facing other Jews like themselves. Photographers, especially Jewish ones, knew Jewish folkways, likes and dislikes. Jewish photographers had the opportunity to capture old, traditional folkways, some of which were changing and disappearing. One cause of picture postcards becoming so popular was this very reason. In addition to its growing commercial success, photography was also gaining acceptance and expanding as an art form. Jews and others found it easy to join with other artists and groups to learn and expand in this relatively new area of expression. One example of how Jewish photo-artists developed and flourished is that of Andre Friedman, known to the world as Robert Capa. Born in Budapest, he left for Berlin at age 18, escaped to France as Hitler gained power and became world famous with his photo coverage of the Spanish Civil War. Who could forget Capa’s photo of a soldier falling backward at the moment of being struck on the battlefield? You may recognize the name of Margaret Bourke-White, in reality Margaret Bourke-Weiss, a Life magazine photographer whose grandparents were Orthodox Jews from Poland. Alfred Stieglitz left his family’s printing business, becoming one of the first great art photographers of street scenes, portraits and nature. The most famous images of World War II were captured by Jewish photographers such as Capa, Walter Rosenblum, Martin Lederhandler and Louis Weintraub. AP photographer Joe Rosenthal captured the famous Iwo Jima flag-raising image, probably the most memorable photo of World War II. Life magazine was considered the prime publication for creative photographers. Look magazine, another pictorial magazine, achieved success under Arthur Rothstein, its director of photography, and its creative artist, Ben Shahn. And if you are not convinced by now that Jews played a significant role in the history of photography, I need only remind you of that famous Life magazine cover photo of the V-J Day Times Square celebration showing the sailor kissing the nurse. The famous image was captured by Life photographer Alfred Eisenstaedt, a German-born Jew. As we get close to Christmas and some children (and adults) still wish for all the fun and, especially, the great music, I thought it might be good to talk about fairness. Kids always tell their parents, “That’s not fair!” What exactly are they thinking? What is “fair”? Fairness is a word that is really about justice (mishpat in Hebrew), and justice may be an even harder word for kids and for us. Judaism has the message of justice deeply implanted in the spirit of Jewish life. The Torah and the Prophets are filled with laws and examples of how to make a fair judgment and the importance of being fair and just. Rabbi Hillel said, “Do not do to others what you do not want them to do to you.” This is a very easy way to understand how to treat others. However, being fair isn’t always easy or simple. Fair doesn’t always mean the same. • Have you ever been treated unfairly? How did it make you feel? • Do you think it is fair that older children get to stay up later and do more things than younger children? Why or why not? Do you think it is fair that boys get to do things that girls don’t get to do? Why or why not? 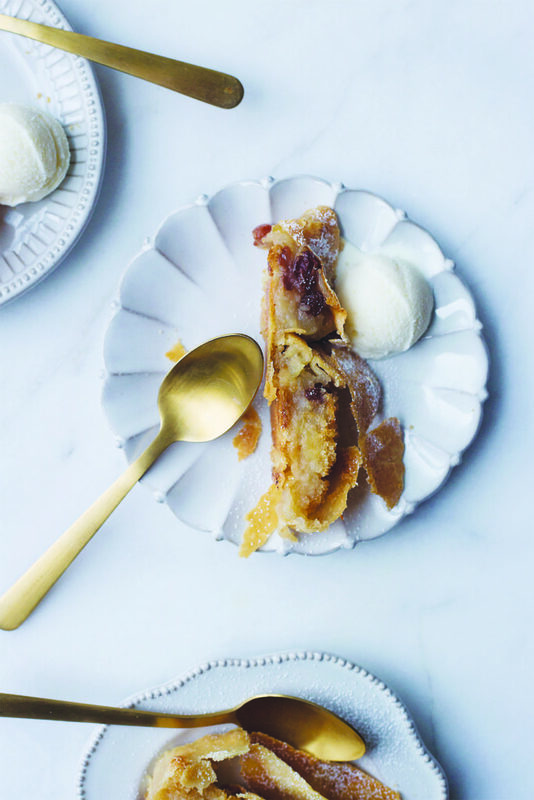 • Some families have a rule that if there is a piece of cake to share, one person gets to cut it and the other gets to choose the first piece. How is this a fair way to divide the cake? Can this system be used in other areas? Talk about the meaning of this story with your family. We should always try to do the fair and just thing. It is an important value to live by.